I got this recipe from my co-worker Debi Fasig. She has supplied our work area with some fabulous food over the years. Many of which have been added to this recipe blog. She changed up a portion of the recipe and added some mini M&M’s on a few, but she didn’t like those as much. So, if you got a sweet tooth these certainly won’t disappoint. Thanks Debi, I think I’ll go grab another before they’re gone. Melt together caramels and butter and add water. Stir in chow mein noodles and peanuts. Drop onto well-buttered wax paper. 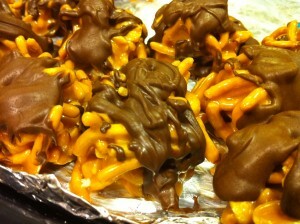 Melt chocolate chips and drizzle over the top. NOTE: When you store these, make sure they are not placed on paper doilies–the cookie will stick to the paper. I usually store them on greased wax paper in a Tupperware container.